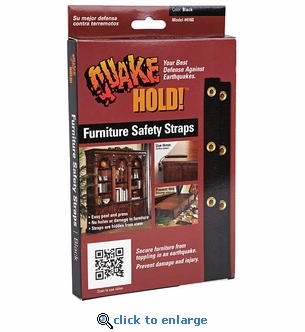 Quake hold furniture straps are easy to install and will prevent china cabinets and other furniture from tipping in a moderate earthquake. Each package contains two 18" nylon straps and hardware, enough for one large piece of furniture. Other end of strap attaches to stud in wall through a grommet hole. Velcro release for cleaning and moving.